James Hynes, author of Kings of Infinite Space and The Lecturer's Tale, elaborated on his favorite Texas books for Salon. 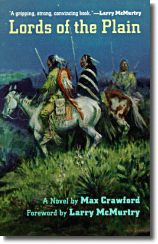 Max Crawford's magnificent 1985 novel of the Comanche Wars, Lords of the Plain. Narrated by a liberal-minded cavalry officer in a pitch- perfect imitation of plainspoken 19th century American prose (think Francis Parkman), this may be the most culturally and politically astute novel ever written about the Indian Wars. It's a thrilling, tragic story, full of adventure and vivid characterizations, but what's best about it is its unforgettable evocation of the llano estacado, or "staked plain," the huge, featureless plateau that takes up much of the Texas Panhandle, and of the gorgeous caprock canyons at its eastern edge, such as Palo Duro and Blanco canyons. Indeed, now that the city of Lubbock sits spang dab (as we say in Texas) in the middle of the llano, the book's long and loving descriptions are probably more beautiful than the llano itself is today. Hynes then looks south to oil country, the milieu of "pulp genius, Jim Thompson." Hynes mentions Thompson's memoirs and his best-known novel, The Killer Inside Me (1952), though it finds it more than a little freaky. Much less creepy, but still gritty and emotionally blunt and often violent, is Thompson's South of Heaven (1967), based loosely on his experiences working on a natural gas pipeline in the 1920s. Unusually for a Thompson novel, the narrator, Tommy Burwell, is no psychopath, but an ordinarily decent if headstrong young man; the novel also features a plucky heroine, some nasty bad guys, and 600 rowdy hobos, desperate for work. What's best about the novel is Thompson's sharp, working-man's evocation of the hard, dangerous labor of laying pipe. His descriptions of working with dynamite, jackhammers and something called a mormon board are nearly as powerful as anything in Orwell--in fact, minus the novel's rickety plot about a payroll heist, this book might even have been called Down and Out in Midland and Odessa. the title character, an unemployed Chicano, washes up in the El Paso YMCA. Here he waits for an important letter and bounces entertainingly off a large, colorful cast of burnouts, no-hopers and never-wuzzers. There's something of Beckett about the book, if you can imagine a combative, horny, smart-mouthed Beckett who sometimes writes in Spanglish and can be flat-out hilarious. 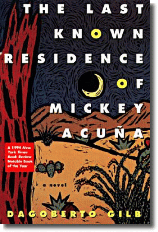 Gilb's version of West Texas, with its tension between the city and the desert, and between his working-class Chicano roots and middle-class literary success, is more up-to-date than McMurtry's. Gilb won't let you forget that before it was its own country, Texas was part of Mexico, and he's a master of the sharp political crack, calling El Paso "the Chicano Ellis Island" and pointing out that Anglos are in the "vast minority" there. It's a prickly, sometimes infuriating book, but there's no gainsaying Gilb's ferocious honesty, especially on the centrality of Mexicans to the story of Texas, and likewise on the subject of who gets to decide who's a Texas writer--or an American one, for that matter. To read the entire Hynes essay, click here. Bryan Curtis made his case for The Great Texas Novel here; Don Graham, an authority on Texas literature at the University of Texas, argued for some other novels here. The Dallas Morning News suggested ten Texas titles to watch for this summer; click here to read about those books. Click here to read an earlier post on a literary guide to Miami and click here for a literary guide to Brooklyn. Click here for a literary guide to Togo.